I was privileged to speak at the Women’s Leadership Lunch sponsored by the School Sisters of Notre Dame, Central Pacific Province. Here is what I shared with them. Good afternoon and thank you all for coming. I always love coming back to Notre Dame where almost all of the women in my family went to school. The foundation has had many meetings here at Maria Center, and I keep thinking that any minute my daughter Carolyn will pop into the back of the room wearing a uniform skirt that had definitely seen better days with her shirttail out, picking up trays of food to take to the art room. But she lives in Nashville now. 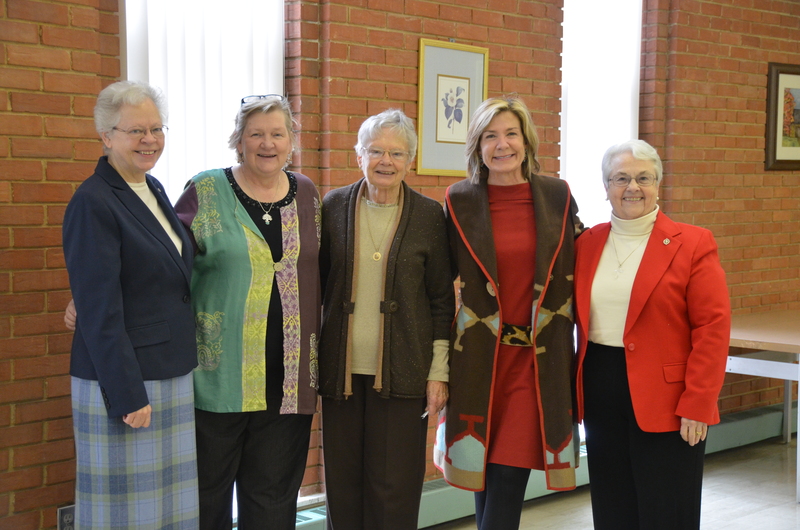 I want to thank the School Sisters of Notre Dame for inviting me to be a part of this today—looking out I see so many leaders from our community. I think about the women leaders who have blazed the path for all us of like my mentor, the late Sr. Mary Ann Eckhoff, SSND and current leaders in our community like the women from Let’s Start, and the future leaders like my daughter, Amelia. It is just wonderful to be back here at Notre Dame where my leadership journey began. How many times as women do we cut ourselves down and put ourselves back rather than accept recognition in the workplace and move forward? That day was the beginning of a mentoring relationship that I will always carry with me. I learned so much from working with Sister. As a leader she had a way of pulling the best out of the people around her. There are two things she always said that come to mind—People live up or down to your expectations. I think that is so true. As a leader, if you expect people to do a poor job, that will be communicated to them in so many subtle and not so subtle ways. It will get in the way of getting things done and it makes people miserable in the process. She also believed that everyone has some type of talent—some people have one talent, others many, and that your job as a leader is to identify the talents of each individual and help them use their talents to the fullest. I guess you could say it was leadership by affirmation. I’ve also learned a great deal from the Incarnate Word sisters who sponsor the Foundation. Over the past few years I have been interviewing our sisters to capture their wisdom (and actually I need to take a minute to thank my wonderful friend, Pat Thibodeau who transcribes these interviews in exchange for me knitting her socks). It seems like everything I’ve learned from our sisters stems from their Incarnational Spirituality, a belief that God is present in all people and in the relationships we have. And what it has taught me is that effective leadership is grounded in relationship. Sr. Mary Pezold, CCVI was the Foundation’s Board chair for nine years and in that time I learned so much from her about leadership. One of the main things is to value relationships. And that sometimes relationships are more important than being right. By that I mean that when you are working with people with a variety of views, there are times when leadership means taking a back seat and telling yourself that even if the group doesn’t do things your way, that’s okay. That’s hard for me since I’d like to think that I have perfect wisdom but the sad reality, is that I don’t. And there are times when what looks like “giving in” is in reality choosing a path that is going to advance everyone to the ultimate goal—a goal that can’t be achieved if you trample on relationships to get there. Her leadership style is centered in respecting the contribution that each person makes to carrying out the mission. She also embodies gratitude. Taking the time to thank people and recognizing the contributions large and small that people make to achieve the goal is so important and often overlooked. To my mind taking the time to thank people, and to not take credit for their work but to acknowledge their contributions to the larger group is a key attribute of a successful leader. It may seem like an oxymoron in our world today, but the most effective leaders are humble and in that humility is great power. Because in being humble and putting others forward, their power is added to your’s and suddenly one plus one equals not two, but four or five. Being a leader is also about adapting and continually growing. Sr. Annette Pezold, CCVI shared that with me when she talked about all the changes that she has seen in religious life and in the world. We can’t be stagnant. Leadership is about new experiences and being open to change, not being stuck in the past. One thing that drives me crazy is when people say, “We’ve always done it that way.” Well when you look at some of the issues facing our world today—where has that gotten us? Like our sisters, we need to continually be open to walking new paths and identifying new solutions to the problems we confront. Being a leader is also about being contemplative. It is about taking the time to reflect and to step back. Sr. Helen Ann Collier, CCVI shared some insights with me about the importance of taking time even if it only for a few minutes to reflect on whom we are, and what we did, and how we did it. It is about asking where God was today, and what did I do in response? It is about forming a contemplative spirit because in that time of prayer we find the strength to bring God to birth in ourselves and in others. I know when I don’t have any time to step back I get stressed out and overwhelmed. That is when I head to my studio and put everything aside and work with the clay. After just 30 minutes there I feel renewed and just so much better. We can’t be leaders if we let ourselves get burnt out. And reflection time clears our minds to enable us to see new solutions or different ways to address nagging problems. There are many days when I go next door to Sr. Mary Margaret Bright’s office to vent about a problem and her response is “What is God trying to tell you?” My first reaction to that is—“Who cares—this problem is driving me nuts!” But afterward, if I take the time to think about it and reflect, many times I see it differently and it is much more likely to work itself out. Leadership also means being authentic—being true to who you are. And that is something I learned right here at Notre Dame. One of my teachers, Sr. Joanne Hanrahan, SSND is here and I can still remember how she emphasized that we needed to speak our minds in her world cultures class. That has stuck with me because one thing people I work with in the community say to me is that I tell it like I see it. There isn’t a lot of beating around the bush. And perhaps that’s because I have gone to so many meetings where women will come up to me afterwards and say, I am so glad you said that. Or I wish I had said that.” Well speak up. Because if you don’t you can’t count on someone else to speak up in your place. Your ideas have as much validity as the next person’s. And finally, being a leader is being happy in what you do. If you don’t find joy in the mission you are trying to carry out then it is going to be very challenging to involve others in working toward the goal. One of our wisest sisters, Sr. Neomi Hayes, CCVI told me once that her work in life is to bring joy to the world. And I’d like to end with a quote she shared with me from Kathleen Norris. As women leaders, perhaps that is our special gift—to bring a new perspective grounded in joy.